Director: Phil BlattenbergerWriters: Phil BlattenbergerStars: Acorye' White, Matthew Ewald, Jimmy Ace LewisSummary: Set in Vietnam in April 1968 - three months after the tide-turning Tet Offensive and one month after the assassination of Martin Luther King Jr. - Point Man is the story of a U.S. Army fire team fractured by racial tensions, moral crises, and the crushing pressures of combat in a war nobody wants to fight. Andre "Casper" Allen, a rough-edged ideologue, finds his radical politics put him at odds with the squad's machine gunner, Silas Meeks. 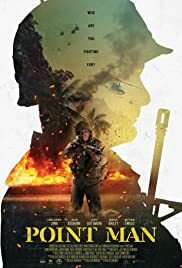 When their search-and-destroy mission in the Mekong Delta goes terribly wrong, both men find themselves pitted against each other and their recalcitrant platoon commander, Lieutenant Sutter. Point men die like flies in the bush, and as loyalties dissolve every step forward comes with a price.